I’m not the flag-waving sort; whatever flag it is. I’m wary of the word “patriotism.” As someone who grew up in China and now an amateur China watcher, it is downright ugly. What it immediately evokes, in me anyway, is government-incited demonstrators on the street who shout patriotic slogans, hiss anti-Japanese hatred, and smash Japanese cars owned by innocent Chinese citizens. As for anti-American hatred in the name of patriotism, it’s the daily fare in the state-owned media. Wariness aside, I too have patriotic moments. I just experienced one Friday evening when I saw this photo freshly taken by Radio Free Asia’s Chinese service. 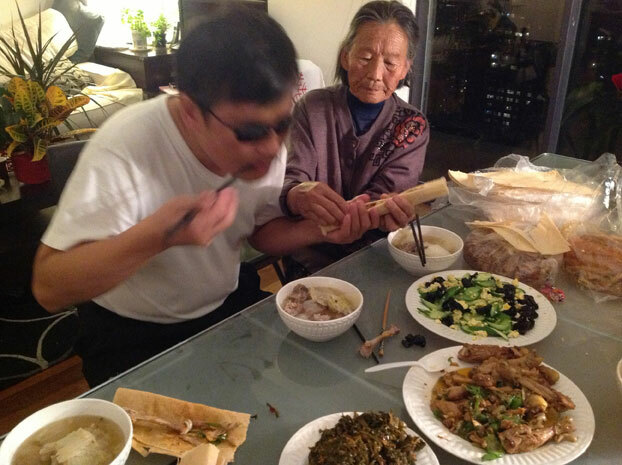 In this photo, the family of Chen Guangcheng is having dinner, and it looks like a rich, delicious homemade dinner that makes my mouth water. His mother, who just arrived on Wednesday to visit, was putting a roll of Chinese pancake into his hand. He is in the middle of chewing something, and behind him, is a pool of bright light, plants and the corner of a cream colored sofa. At the right corner is the illuminated night skyline of New York City. When I posted this photo on Twitter, tweeps from China were quick to tell me that those were Shandong-style pancakes and likely brought to the US by the mother. Piles of them, wrapped in plastic bags, reflect the light. The son and mother look positively, well, at home. For a moment no longer than a couple of minutes, I felt like I was hit by a ball of densely-packed emotions. It has to do with the reunion, the pancakes, the lights, the night indoor and outdoor, and the fact that they are far away from China. Until April, 2012, Chen Guangcheng had been locked up in his own home, in the village where he was born and grew up, and where his ancestors had lived before him, by scores of thugs hired by the Chinese government. Surveillance cameras mounted on the roofs of his neighbors, on the walls of his own home, monitored him 24/7. He couldn’t call anyone, and for a long time, no one had heard anything from him. One summer day, when a rainstorm damaged the shield that blocked communication signals, he was able to make a sneaky call to a friend of his in Beijing. For that call, he and his wife was beaten for hours with his mother as a witness. Heartbroken and desperate, she howled for hours into the depth of that night. It was said that, after that incident, his jailers sealed all of his windows with steel sheets. His aging mother was not allowed to go to town to see doctors. Thugs followed and watched her when she went to attend her vegetable beds. Living in the same village, his brother Chen Guangfu (who accompanied their mother to the US on Wednesday) couldn’t visit him for months on end, and couldn’t even get close to the compound where he and their mother lived. His son, less than ten years old and in the care of a relative, couldn’t visit his parents. Living in neighboring towns, he hadn’t seen his son for several years. Before these atrocities, unthinkable in any civilized society, the blind man had been locked up for more than four years. All because he stood up against brutal forced abortion widely practiced in rural China. Around this time in 2011 and onward, there had been a steady flow of rumors that he had been sick with rectal bleeding and stomach illness. But it was impossible to just confirm the state of his health. In our age of cellphones and Internet, the Chinese communist government was able to stonewall any words about him, a living man known around the world. I came to Twitter at the beginning of 2012 mainly because my Sina Weibo had been deleted for posting the “Free Chen Guangcheng” information. I remember, for a long time, whenever I logged on Twitter (I wasn’t nearly as active as I am now), I was besieged by dread. I was afraid that one day I would get on Twitter and be struck with the news that Chen Guangcheng was dying or had died. Sometimes my fear got to the point that the very thought of him dying would reduce me to tears and sink my heart into an abyss. It’s been over a year and a half since he made his miracle escape from the prison that was his home. Anyone can imagine why his 80-year-old mother would want to travel this far to see him. He is the youngest of her five children; he is blind; he has suffered a lot; and she has witnessed the atrocities against her son. If each trauma leaves a scar on our heart, I imagine her heart must have been badly bruised and bleeding. She has to see him, touch him, and know he’s well. She needs peace. What stirred me is that she has to travel this far from their own home in Shandong to New York City oceans away to see him, touch him, bring him her pancakes, and know that he and her daughter-in-law and her two grandchildren are well. She has to come to a foreign country to be at home with her loved ones. In the photo, she was holding a rolled-up pancake with her left hand supporting it and her right hand settling it into his palm. As my eye paused on her hand and her son’s under hers, there erupted in my heart a feeling, as sudden as it was, that I can precisely describe: a pure, concentrated surge of patriotism. By China Change in Analyses and Opinions, Rule of Law on November 9, 2013 . Thanks, Aura. I don’t in general give a lot of thoughts about patriotism. I always think people should be bound by values, not by borders or race. You are right, it comes down to something very simple. Thanks for the link. I am grateful for having such an unexpected moment, and the purity of it is surprising and deeply satisfying.